Parva Farm also keeps sheep (mostly Welsh cross ewes and Charollais rams) and has a small herd of pedigree Hereford cattle. There is also a Shetland pony, a Welsh Cob and two sheep dogs. Self-guided vineyard tours, followed by a wine tasting may be taken during our opening hours of 1pm - 5pm, every day except Wednesdays. The entrance fee is £2 per person. Thursdays during July & August at 5.30pm. These tours last approx. 2.5 hours and do not need to be booked in advance - just turn up! The cost is £12 per person. For all tours, sensible shoes should be worn as the grass can be slippery when wet. For further details please contact us. Enjoy a guided tour of the vineyard followed by a tutored wine tasting. For groups of 8 to 30. Advanced bookings only, £12 per head. Vineyards around Wales celebrate Welsh Wine Week. We will be open each day that week from 11.30am-5.30pm (incl. Wednesday). We also sell home-grown garden plants and shrubs and there is a half price plant sale in the autumn. We sell Christmas trees in December! Spring event - see the lambs! See the lambs Sat. 20th April - Mon. 6th May 2019, every day from 11.30am - 5pm. Admission is £1 per adult and 50p per child for charity. 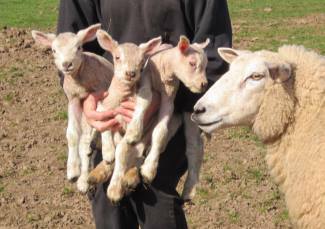 Every year in the spring, after lambing, we hold a sheep exhibition called ‘See the Spring Lambs’ where visitors can see and stroke ewes and lambs of various breeds and sometimes bottle feed orphaned lambs. There is also information about sheep farming, wool etc.